Universal and very ancient, a social disease par excellence, Tuberculosis is infectious, contagious and due to Koch's bacillus (BK). Person to person transmission takes place through the atmosphere, from infected lungs. Having progressively perceived the infection and the disease of tuberculosis, the physicians of the Colonial Health Service study the geographical extent of the disease and analyse its epidemiology. One of them, Calmette* and his collaborator, Guérin, invent the anti-tuberculosis vaccine which is called BCG. Following their lead, the colonial Pasteur Institutes distinguish themselves in the intensive fabrication and perfection of BCG vaccines, easily handled in the tropics. The prophylaxis of the disease then becomes possible. From 1944 onwards, the discovery of anti-tubercular antibiotics brings about a revolution in the treatment and prognosis of the disease. The plan to combat tuberculosis overseas becomes more and more efficacious. However, even if until the advent of AIDS the regression is clear in developed countries, the scourge remains terrible in the third world. At the present time, between two and three million people still die of tuberculosis every year in the world. In 1882, on examining the saliva of patients suffering from fever, loss of weight and chronic coughing, R. Koch isolates a microbe of which he obtains pure cultures. These microbes induce tuberculosis in those used as guinea-pigs. This Koch bacillus or BK is Mycobacterium tuberculosis, the agent responsible for tuberculosis in humans, a disease known for a long time and recognised as contagious. Almost all the organs can be attacked. Person to person transmission is due to droplets emitted by the coughing of a person suffering from pulmonary lesions. For a long time, it is thought that there is only one variety of human BK. In the 1960s, in Dakar, Boiron*, studying colonies of isolated BK in patients systematically, notices in more than half of them original characteristics, intermediary between human and bovine tuberculosis bacilli. This new variety is the object of much research at the Pasteur Institute of Dakar (Sarrat*), at the end of which, from 1973, this bacillus is recognized as a species : Mycobacterium africanum. This discovery leads to the notion of the geographical distribution of BK colonies. Thus, besides the Dakar variety, a Cameroon variety is isolated in its turn, two Rwanda varieties and, beyond Africa, an Indochina variety. Moreover, Koch isolates from the cultures a substance, tuberculin, to which he mistakenly attributes therapeutic properties. Later, Von Pirquet and then Mantoux observe that the intradermal injection of tuberculin causes an allergic reaction which is a sign that the subject has had a previous encounter with BK. Since 1907, the cutaneous reaction (and the intradermal reaction since 1909) permit a different approach to the epidemiology of the disease. All the subjects who, having inhaled the tubercular bacillus, carry it in their organisms are not said to be tuberculous. In the case of the majority, the bacillus, neutralized by the defensive reactions of the individual, remains harmless. The cutaneous reaction to tuberculin confirms the contamination : it is the primary infection. These subjects, while remaining infected with BK, are not contagious and are apparently in perfect health. On the other hand, if the BK regains its virulence or if, as a consequence of superinfections, the defence mechanisms are unable to cope, the bacilli attack one or the other of the subject's viscera. Then the infection becomes a disease and the patient tuberculous. In the tropics, physicians note that the predominant clinical forms are not the same in the cases of city dwellers and rural inhabitants. The former, exposed to BK since their youth, develop a certain immunity or resistance to the disease. Attacks on the lungs are the most frequent. The latter, following the dispersion of the population, contracts the malady later, in general about the age of 20 or over. Because of the absence of immunity, the disease is going to break out violently, a phenomenon which some have chosen to call "tuberculosis of the virgin races" ("la tuberculoses des races vierges") where the disease is located in other organs than the lungs and manifest extremely acute developments. The forms observed in the big cities of the colonies and in Indochina (where the Annamese have been victims of tuberculosis for centuries) are not at all different from those to be found in Europe. But on the other hand, in Black Africans and Malagasies, extrapulmonary forms are observed, which evolve rapidly with the generalisation of the infection. The opinion has long prevailed that tuberculosis is a disease of temperate zones, introduced into the colonies by Europeans. Moreover, a Black person settling in Europe - worker, soldier or student - is fragile and falls prey to this ailment and, when back in his country, contaminates those around him. The reality of the dissemination of the disease by such people coming from Europe, especially trained native soldiers, is indisputable. But it has been established that, for thousands of years, an autochthonous tuberculosis has been present in Africa as well as in Madagascar or in Indochina. In the 19th Century, it is observed in South Sahara, in AOF, notably in Niger, Sudan, Cameroon, etc. 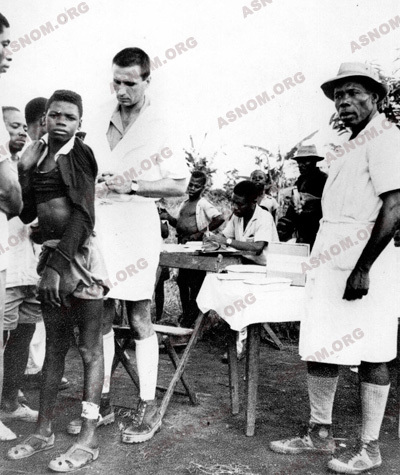 Botreau-Roussel*, in the 1930s, finds that skin tests reveal positive results in the case of 84% of young recruits from the Ivory Coast, people who have not had previous contact with whites, which leads to the supposition that they are from ethnic groups particularly affected by the ailment. in most of our colonies". Taking into account only the cases of tuberculosis identified accidentally in health training centres, the official reports give derisory figures such as 2 791 cases declared in 1938 in all the colonies (Grosfilez* and Lefèbvre*). Diagnosis is made almost exclusively by the examination of spit and, in general, without having recourse to X-rays. Twenty years later, with the use of more rigorous methods, the figures are multiplied by 50 or more. - In Indochina, in 1895, dozens of patients are detected, especially in Saigon and Tonkin. The mortality rate is high. Cambodia and Laos seem to be spared. The most affected are the Annamese. In 1903, Hénaff* writes that in Cochin China, the disease is very ancient, known by the name of "binh ho lao" (cough and consumption disease). In fact, he says, loss of weight is such that "these unfortunate native sufferers of tuberculosis look like wizened spectres". Among the circumstances that favour transmission, one mentions the promiscuity in Annamese schools, the mouth to mouth passage of opium pipes and insalubrious brushes (which contain food and saliva). - Clarac* has said that in Madagascar in 1905 the disease is "more frequently to be observed in large conglomerations than in the countryside". Certain ethnic groups seem to be strangely spared. - In Black Africa, the disease is reported in all the territories. Kermorgant* notices two facts : "on the one hand, its rapid extension since the beginning of colonization"; on the other hand, the scarcity of the phenomenon as one gets further away from the ports, "as the contact with Europeans diminish". In 1913, after the discovery of tuberculin tests, Calmette* establishes a vast investigation to determine the degree of tuberculous impregnation in African populations. In French East Africa (AEF), the statistics reveal an average of 15% positive reactions in adults. It is also confirmed that the figures are proportional to the extent of European penetration in these territories. The comparison with the data obtained in this primary investigation makes it possible, later, to quantify the incessant progress of the disease. Thus, around 1950, with the absence of mass vaccination, positive skin tests increase by 30 to 40% in these same regions. At the beginning of the 20th Century, intensive research is undertaken to find protection against the disease with a vaccine. Calmette*, a colonial physician, and Guérin, proceeding from a bovine tubercular bacillus, invent an anti-tuberculosis vaccine which is named after their initials, BCG (Bacille Calmette Guérin) and which is still used. Administered to a young child in 1921, it is recognized as the best means of combating tuberculosis and the least expensive. 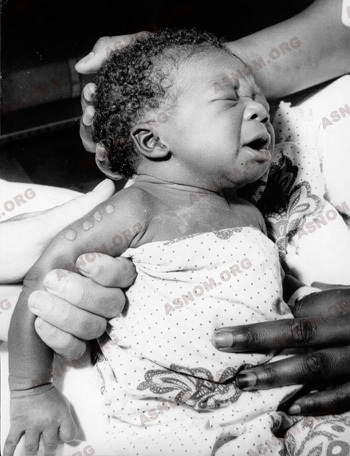 In 1924 in Senegal, Mathis* becomes the first to administer it to new-born babies at the Maternity Hospital in Dakar. That same year, BCG is introduced into Indochina and systematically administered in the Maternity Hospitals of the big towns : in 1930, more than 100 000 new-born babies were vaccinated. The preparation of BCG soon becomes one of the most important tasks of the colonial Pasteur Institutes which adapt the product to tropical climatic conditions. - The initial vaccine of Calmette* and Guérin called "fresh", administered orally, is fragile because it is inactive when there is heat and light. - From 1936, a new version is administered subcutaneously. - Towards 1950, Boiron*, at the Pasteur Institute in Dakar, uses a form that is frozen and dried, administered by scarification in a solution of gum Arabic. - In 1970, Chambon*, at the same establishment, perfects a lyophilised vaccine, injectable by intradermal means, which tolerates heat and can be preserved for many months. It is rapidly adopted all over Africa. This combat is undertaken simultaneously in the domains of preventive medicine and curative medicine. In the big towns an important plan of action is established in the 1930s. - Systematic detection using skin tests with tuberculin is the rule in PMI (Protection maternelle et infantile) dispensaries, especially for children who have lost weight, who are coughing or have fever. It is also practised by the Hygienic Services and in medical schools. Some mobile teams assure x-ray detection. The first of these appear in Indochina at the end of the 1930s, in Africa ten years later. - Epidemiologic investigations by intradermal reactions to tuberculin observed in children under 15 are multiplied. In Senegal, in 1960, the rate of positive contamination is 15% before the age of 7 and 46% at the age of 14. The disease is certainly "a public health problem", as defined by the WHO. 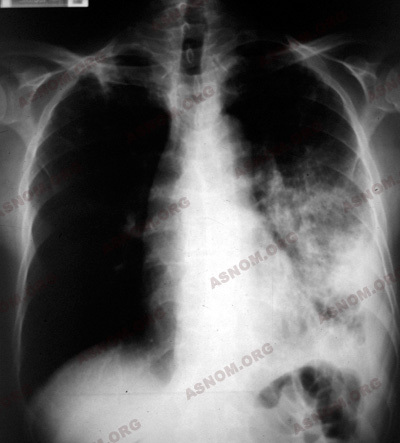 This is confirmed by the mobile teams performing pulmonary x-rays and the repeated bacteriological examination of saliva. This same year, a total of 150 to 200 new cases of tuberculosis are detected every month in Dakar (of which a good proportion come from the interior of the country). - BCG vaccination is the most important prophylactic measure but it is only used in the case of children. The new-born receive it in the maternity hospital and bigger children are vaccinated at home by visiting nurses who keep an eye, at the same time, on the families of tuberculosis patients. Vaccination comes to be used generally and, from 1973, it is included in the PEV (Extended Vaccination Programme). then choline, finally gold compounds which are more tonic than effective. Collapsotherapy is in vogue until the Second World War : "Artificial pneumothorax" is the process of injecting air periodically into the pleura to compress the affected lung and thus to render relief to the lesions underneath. These treatments are given only in the big towns, for those who are not hospitalized, at the anti-tuberculosis dispensary, at the Institute of Social Hygiene or in the hospital. The tuberculosis ward is separated from the wards for other contagious diseases. Only Indochina disposes of a few sanatoriums. With this plan of action, some patients are cured but they are a minority; not more than 30%, a figure that corresponds to that of spontaneously favourable evolutions. 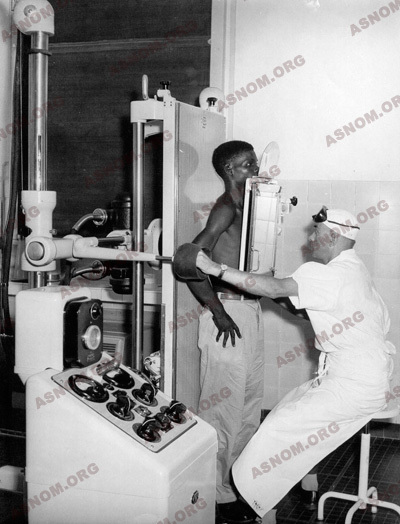 From the 1950s, the modernization of health equipment and the spectacular efficacy of new medicines against tuberculosis (streptomycin, isioniazide, etc...) increases the statistical figures, all the more as patients now crowd into specialized services. The death rate is frightening. At that time, in the paediatric services of the Dakar Hospital, one death in eight is due to tuberculosis. The combat which ensues involves, on the one hand, the evaluation of needs and, on the other hand, the establishment of means to fight the disease. The treatment of patients is assured in specialized institutions: the anti-tuberculosis dispensary in Antananarivo, the phthisiology service of the Institute of Social hygiene in Dakar. These establishments possess x-ray installations and laboratories and are stocked with active anti-tubercular medicines. They are directed by phthisiologists of the Colonial Health Service. In 1959, more than a million new patients are treated in Dakar, half of them severely affected. The greatest number, after brief hospitalization (often refused) are followed as non-hospitalized patients while the least curable (usually the most contagious) remain hospitalized for a long time in wards where there are always an insufficient number of beds. Running away is not rare while interrupted treatment facilitates the production of tuberculous bacilli resistant to treatment. It becomes possible to practice thoracic surgery on the spot. Finally, the combat against tuberculosis is registered as an element in regional coordination: the tuberculosis section is created inside the OCCGE in 1969. In Madagascar a sanatorium is established in Fenoarivo, on the central plateau. Social action completes medical action. Public services are supported efficiently by benevolent associations (The Red Cross, the Anti-tuberculosis League) whose action in the Ivory Coast, through the impetus given by Delormas*, proves to be particularly invaluable. The results obtained reflect modern progress. 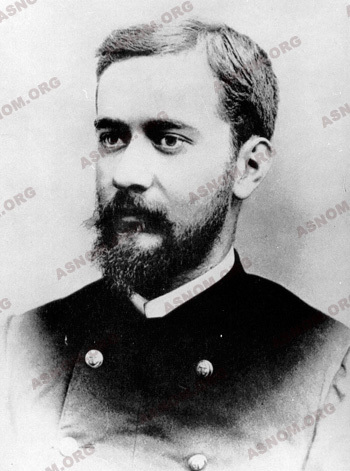 Thus in 1959, in Antananarivo, Bordas* and Mistrot* obtain, respectively, a cure and a distinct improvement in 54% and 21% of the tuberculosis patients treated. - Kermorgant M. : Rapport au congrès de la tuberculose en octobre 1905. La tuberculose dans les colonies françaises. Ann. Hyg. Med. Col. 106,9,220. - Calmette A. : Enquête sur l'épidémiologie de la tuberculose dans les colonies françaises. Ann . Inst. Pasteur. 1912, XXVI, 497. - Sanner L. : Tâches et problèmes de santé publique en AOF: La tuberculose Rapport de 1954. - Menu P. Rivoalen A. Revil H. : La tuberculose : Endémie africaine. Méd. Trop. 1956,16,187. - Brochard H. : La tuberculose des noirs transplantés. Rev. Prat. 1965,15,221. - Sankale M. : Aspects actuels de la tuberculose pulmonaire du noir africain transplanté en europe. Mars. Méd.1980,221, octobre/1,31.